Apart from its ultra popular search engine, Google has many more products and services to offer. To name some, you have got Gmail, Google Maps, Google Drive… .Etc. and the list continue on. Most of you must have used these services in your day to day life, but again not all of us are aware of the many additional features which these products and services have up their sleeves. Generally we are happy with the basic features that these services provide. However, if you want to do a little more with all of Google’s products and services, you should know that Google offers free tips for all its products and services. 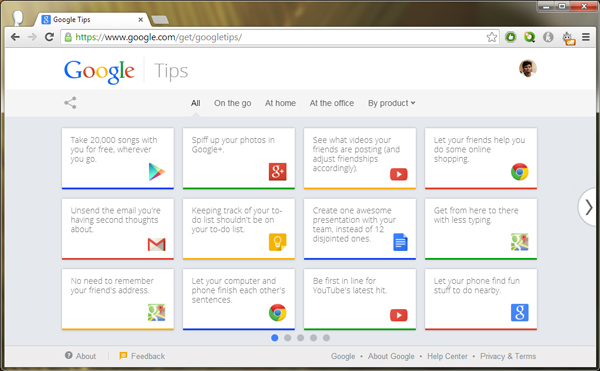 Head over to https://www.google.com/get/googletips and get to know about the various useful tips that Google has to offer. You would really be surprised by what you can do with these tips, Just for an example, How Many of you knew that you can use YouTube as a Jukebox or Watch YouTube videos without loading on Android? These were some of the many tips that Google offers for all its products and services through the official tips. Make sure you read through as much as possible and i am sure you will find something very useful too.